Wojciech Pacuła: How did Acoustic Revive start? Ken Ishiguro: Acoustic Revive started in 1997 by launching RD-1 disc demagnetizer which was developed by me. Afterwards, Acoustic Revive developed audio accessories of every kind, and our products won many prizes such as Audio Excellence Award which is the highest award in Japan. For example, we won gold prize in the AEx accessory section 14 years in a row, and won gold prize in the cable section 8 times, including 5 years in a row. Now we feel proud that Acoustic Revive is No.1 accessory&cable brand in Japan. What is the main idea behind Acoustic Revive and its main philosophy? Our philosophy is that audio accessories must not change the sound; they can only remove noise and its adverse effects. Our products remove bad factor such as noise or distortion, but do not spoil dynamics or sound energy. It means that the performance of audio equipment can be shown in 100%. 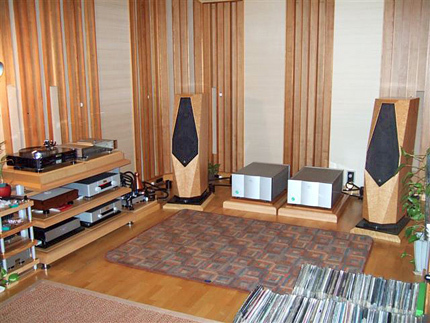 What is the most important thing an audiophile should start with in one's system? A proper mental attitude is important, to not be deceived by a big change of sound. For example, emphasizing treble might give you the impression that the sound became fresh and treble more detailed. Or you might interpret emphasized bass as richness and thickness of sound. However, emphasized high/low range might be just noise or distortion. If that is true, the original information is masked. In addition, some people sometimes take mistakenly such irritant and distorted treble for high resolution and plenty of information. As we can understand easily in the case of video such as hi-vision or 4K, high resolution is not sharp/rough but is smooth. How do you prioritize accessories, I mean, from the most to the least important? I will come back to that question about priority later. 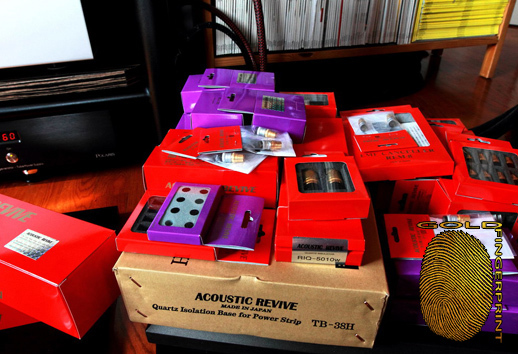 Regarding the important accessory, all Acoustic Revive accessories are important. Audio problems are not solved only by one improvement somewhere. We can get ideal audio environment only by taking care of the whole such as cable, vibration, noise and room tuning in equal proportions. Of course, we can never get good sound only by using expensive equipments and speakers. Why large audio manufacturers don't care about such improvements? I think that audio equipment manufacturers and engineers are proud that their equipment is a main factor of sound improvement, and think that cable or accessories cannot significantly improve the sound; they can only change the sound at best. Indeed, cables and accessories change the sound; moreover, truly superior cables or accessories can improve the sound. Even in the case of audio components, their sound changes not only due to different circuit designs but also due to the type of wiring, capacitors, resistors, casing design and its material, etc. 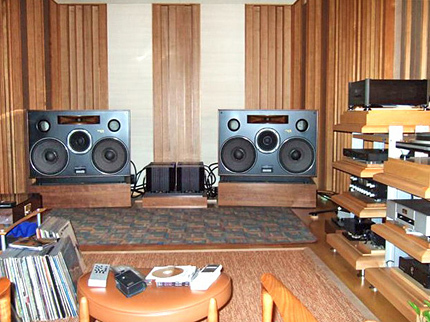 What could you advice an audiophile to start with? Coming back to the priority of cables and accessories, in the case of cables we should change them from the top down. Regarding power cords, I suggest the following order: (1) wall outlet → power strip, (2) power distributor → CD player, (3) power strip → amplifier. We can compare electric current to water. If the upper stream is muddy, downstream is muddy too. Moreover, a “downstream” cable might emphasize flaws of “upper stream” cables. 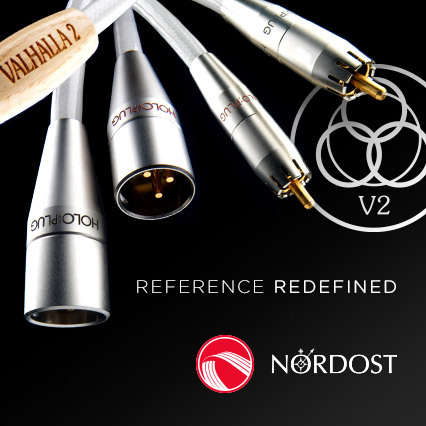 Since cables are necessary in any audio system, unlike accessories, we should use good cables. Ideal cable is one without transmission deterioration, distortion, noise and sound coloration. It means a cable that does not change signal quality. As to accessories, it is ideal to start with room tuning. But please note that room tuning might easily make things worse in terms of phase and feel. My suggested order of changes: (1) room tuning, (2) vibration control (boards, insulators), and (3) anti-noise measures. How can we measure changes your accessories bring to the sound? We can measure frequency characteristic by an analyzer, and can measure S/N ratio by latest spectrum analyzers. However, the best measuring instrument is the human ear. Only the human ear can perceive music feel or timbre. We should listen not only to audio equipment but also to live performances, and should appreciate wonderful pictures or read books to refine our sensibility. Manufacturers of audio accessories are often accused of selling snake oil. 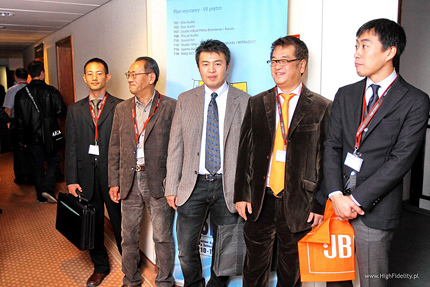 You, however, from the beginning cooperate with technical universities. Could you give us an example? Acoustic Revive cooperates with Faculty of Engineering, Gunma University. For example, the following analysis was done by Gunma University. (see HERE). I think that changes in sound should be proved scientifically as much as possible. Also in the case of audio equipment, the size of sound changes brought about by different material and structure should be verified scientifically. However, because we need considerable amount of money for a university collaborative research, I think that a joined effort by the whole audio industry is necessary. What do you think about the future of CD format, if there is any “future”? And what about the “old” high-resolution formats – SACD and DVD-Audio? Like vinyl, the CD format may also continue as a minority. The sales of SACDs and DVD-AUDIO decrease. I think the reason is that no audio equipment to pull out maximum performance of SACD and DVD-AUDIO has been developed. The reason why the CD sound quality improved rapidly is that CD data can be sent from the transport to the D/A converter made by another company by digital-link such as SPDIF and AES/EBU. And there are many companies able to develop high quality components of that type, which increases competitiveness. On the other hand, SONY did not allow that with SACD and that seems to have delayed its development. DVD-AUDIO needs 5.1ch home-theater environment. And because a display output from DVD player is necessary to operate, it seems not to have spread as pure audio. In fact, there was no SACD or DVD-AUDIO player exceeding highest separated CD players in sound quality. But recently, dCS flagship SACD system has been launched which exceeds the highest separated CD players. It is good news for audio industry and SACD. Do you think that audio files will replace the CD format? Distribution by means of Internet should become widespread, and files (data) should become main audio source. However, CDs and SACDs will not disappear because there are people who need a tangible object. Some people feel attracted by a package decoration, and some people do not feel the pride of ownership of intangible objects. Since vinyl era, covers have often been attractive as the work art. If CD and SACD covers have similar attraction in the future, disc source will survive by the artistry. Moreover, some people may feel uncomfortable operating a PC or a network player, and may stop listen to music.